Just so you know, and I am sure you already do, but the Laura Mercier tinted moisturizer is the best thing ever. I swear by it. So light! I love the home articles, this time the Porcelain bowl is my favorite part. @ Sadie + Stella : You're so right about the Laura Mercier stuff! It really is amazing. I read about it in Instyle this month and decided to give it a shot. I love it! This series is so dangerous for me, I love every single piece! I am just going to echo Liz, she said it perfectly! I NEED the Leif S&P shakers and the WG bowl- adore! Really great set with such pretty colors! In love the salt and pepper shaker. Those tortoise sunnies are amazing! I've been on the hunt and may have just found the pair I want! those Carven shorts are incred! Does anyone know who the neon lace skirt is by? @ Running Disorder.. I'm not sure about who makes the skirt. It looks a lot like Christopher Kane, but I can't be sure. I see a few of my current obsessions here! Oh, those Carven shorts…to die for! 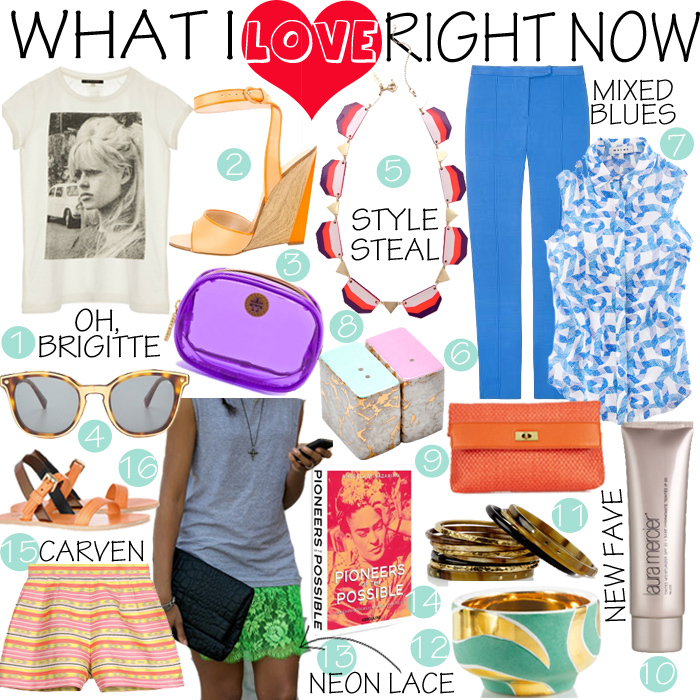 I did a Carven post the other day including those shorts. Lovin that neon lace too! 5, 12 and 9 please! Ha. Always love this series that you do. Yeah pretty darn obsessed with everything. Those blue pants and top are so amaze. MISSED YOU at Lucky Fabb!